The Obama Justice Department’s ridiculous – and dangerous – attempt to hide the truth. 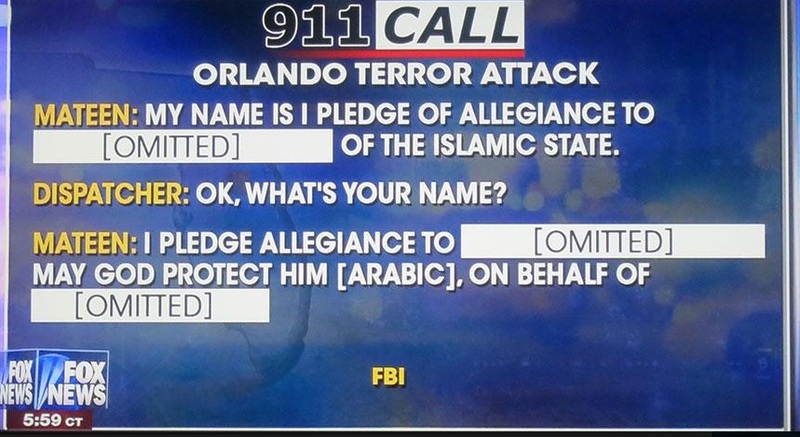 And, astonishingly, Attorney General Lynch announced on NBC’s Meet the Press Sunday that DOJ would release a partial transcript of Mateen’s 911 calls – without any mention of this savage’s objective: radical Islamic terror. It is highly self-destructive for Obama, Clyburn, Lynch, Hillary Clinton, and many other leftists to pretend that Mateen was not a Muslim extremist, and that the radical Islamic terror attacks in Orlando, San Bernardino, Chattanooga, Fort Hood, and elsewhere somehow involve anti-Hispanic bias, workplace violence, and every matter under the sun – except Islam. More ominously, Obama’s ostrich-like “leadership” model excuses him, and other Democrats from confronting Saudi Arabia about sponsoring radical mosques in America and overseas. If militant Islam is not part of this picture, then why remove Muslim-extremist imams from U.S. prison chaplaincies, where they radicalize inmates? If Muslim extremists have no thirst for blood, then detainees at Guantanamo might as well go home, become management consultants, and prune bonsai trees on weekends.